Progress Notes features doctors and medical students across the country on the frontlines of our health care system. Our views and experiences are diverse, but we share common goals and values. We speak up to move toward a future where everyone can have access to affordable, high-quality health care. Please share our posts, and follow us on Facebook and Twitter! March 4, 2019 at 9:10am . 1.) Background Checks on All Gun Sales: The U.S. House of Representatives passed two common-sense bills to ensure that there are background checks on ALL gun sales and can keep guns away from those who shouldn’t have them. The ball is now in Senator Mitch McConnell’s court. 3.) MEDICARE FOR ALL: Democrats in the U.S. House of Representatives unveiled a proposal to move all Americans into the government’s Medicare health insurance program. The legislation has more than 100 co-sponsors. GORDIAN KNOT: “I feel like I need a Ph.D. in prescription drug-pricing to understand how the heck this industry works,” Senator Maggie Hassan (D-NH) During Senate Finance Committee meeting with seven senior pharmaceutical executives. February 17, 2019 at 7:54pm . DFA wanted to add some additional clarity and answer some of the great questions that our members have asked us regarding the recent announcement that the National Physicians Alliance (NPA) will be joining DFA. First, these are exciting times! DFA will now be a bigger home for everyone, and your determination to change the world for your patients can be a part of our expanded family. DFA now will have an expanded platform as the clear go-to progressive group of 30,000 physicians and medical trainees for policymakers, the media, our advocacy partners and others. As the saying goes, “the whole is only as strong as its parts.” Each of you play a vital part that can and will strengthen the whole. Second, for the past year, DFA members have been resisting the harmful direction pushed by numerous policies proposed in Washington, D.C. and in state capitols throughout America. To bolster your efforts, we have been rebuilding our internal and external infrastructure. In fact, we are adding three organizers, a communications consultant, and other consultants by April. The prospect for additional growth is very positive for the rest of 2019. However, the biggest shot in the arm so far will be our colleagues from NPA joining DFA. This will give DFA more strength and influence, and the means and ability to support our members to make our country healthy, safer, fairer, non-discriminatory, and an environmentally-friendly country for all us to live in. In the coming weeks and months, we will be sending out listservs, holding conference calls and webinars, and providing options so that leaders can listen to you on the ways you would like to participate and activities that we are now engaged in. In addition, we will be sending out surveys to receive your ideas, assess your positions, and crowd-source ways to make us all stronger. All your questions, now and future – please send them and we will do our best to answer them. 1) Specifically, what is happening? Our friends at NPA are folding into DFA. You can call it a merger, acquisition, “folding-into” or whatever term you want to use. The most important thing is that physicians are coming together. This is positive, and we encourage everyone to view this as a win-win for the progressive physician community and – more importantly – for our patients. Both organizations have been, and will continue to be, focused on the needs of our patients. 2) Is this now a new organization? No, it is not. It is still Doctors for America. 3) So, is there a new name for the combined organization? No – there is not a new name. It will still be called Doctors for America. 4) Does the Structure of DFA Change? Who are the leaders? Is there a new joint board of both organizations? No, DFA’s board is still the board going forward. See question 6. Regarding leadership of Issue-based Working Groups: See question 7. Doctors for America staffing will stay the same. DFA will be adding three new organizers in 2+ months, and we are currently adding 4-5 consultants. 5) What will happen to NPA? NPA will officially be closing their doors on March 31st. They have some logistical items that need to be taken care of after the AMSA conference that NPA is involved in. As of March 31st, NPA will no longer legally exist. 6) Will there be a joint or combined board? No, DFA’s Board will still be the board in charge. NPA’s current Board Chair, Jeff Huebner, has been offered a position on DFA’s board, which he has accepted. He will join DFA’s board in the coming months. DFA is internally assessing our current board make-up, including the skills and diversity of backgrounds that currently exist on the board, and what skills and perspectives DFA's current board may be missing. DFA's bylaws and our values mandate a board with ethnic, gender, geographic and specialty diversity. An invitation for additional board members will be sent to all DFA/NPA members in the Spring/Summer. Anyone can apply, and we will welcome applications from NPA members, leaders and board members within NPA. 7) How will NPA members be integrated into DFA? NPA leaders have been and will continue reaching out to their leaders to engage them to stay active and encourage them to connect with and join DFA’s issue leadership teams. NPA leadership will be forming an ad hocgroup to engage their members and encourage them in an ongoing fashion to become part of DFA in the coming months. NPA members (all individuals!) will be encouraged to join DFA and make sure they sign-up for specific issue groups that they are interested in being part of, that they get in touch with DFA members to form new relationships, and that they relay their interests and experience. DFA has recently been approved for several grants to work on Gun Violence Prevention and Prescription Drugs. As part of this, DFA will be expanding the leadership role of its issue working groups and thus welcomes everyone who wants to take a direct or in-direct leadership role in these issue areas to be part of our leadership teams. 8) Will all NPA members be part of DFA? DFA hopes and plans to engage every member of NPA to become a member of DFA, but, of course, it is each person’s choice whether to become a DFA member. In a few states, a collaborative approach among many organizations, including local chapters and members of DFA and NPA, has been operating for years. This should continue – these local connections are part of what make us confident that this joining will be so productive. It is up to state leaders, old and new, to determine any changes they would like to make in their state. With these new foundation grants that DFA has received, we will have some staff resources working in 8-10 states. The exact states are not yet all finalized. However, our Gun Violence Prevention efforts, we will be focusing in WI and MN and some national work due to the goals of the foundation funding. The six states that will be the focus of our Prescription Drug work will be determined by mid-March. As required by our grants, DFA will be rebuilding our state chapters in those among these 8-10 states that do not have active chapters and hope that this can be a template and provide resources to other states. During several DFA State Leader calls last spring and summer, we discussed and did a survey regarding establishing “teams” of state co-directors. This is already occurring in a few other states. The thinking is that such a leadership “team” can allocate the volunteer workload, thus not placing an undue burden on just one person. As this development begins this spring and summer, we encourage anyone to be part of this rebuilding process. 10) Where will donations from NPA be directed to? In short, DFA – A new donation page for NPA members has been established on the DFA website. 11) What NPA programs will be moved under the auspices of DFA? DFA has operated predominantly on the strength, passion, experience, and initiative of our many amazing members over the years; your volunteer efforts have been the most important factor in the progress we have made, the advocacy wins we have achieved for our patients, and the opportunities we now have. With that said, DFA, in agreement with NPA, is committed to keeping the following programs running after this transition is completed. However, we MUST raise the resources to make these programs continue to happen. v. Regarding “Making Health Care Fair: This has been an independently managed and funded public education and advocacy project. NPA has served as their independent fiscal agent and that responsibility will now be assumed by DFA. February 14, 2019 at 10:11am . Doctors for America (DFA) and The National Physicians Alliance (NPA) are excited to announce that they have joined forces to advocate for a more just health care system that achieves health equity and universal, affordable health care for all. By merging these two progressive physician organizations, Doctors for America will now have the power and voices of 30,000 doctors and medical students who will fight together for the most critical issues that affect our patients and the public health of our nation. As physicians on the front lines of medicine, we see firsthand the struggles encountered by our patients in the health care system we currently have. We are uniquely poised to share our experiences and the experiences of our patients to inform public policy. For too long, the voice of physicians and medical students have been pushed aside in public policy debates. We have been told that “This is NOT our Lane.” We strongly disagree - This is OUR lane and our voices and activism will be heard. DFA and NPA now stand as one representing a new force in public discourse and policy. Stronger together, the new organization created by this merger will amplify our mission to mobilize doctors and medical students to be leaders in putting patients over politics on the pressing issues of the day, in order to improve the health of our patients, communities, and our nation. We practice and study in the largest cities and the smallest towns of America from New York City to Salt Lake City. We work in private practices, academic centers, community health centers, and government-run systems like the Veteran's Affairs and the Indian Health Service. We work in primary care, surgery, and many subspecialties. Some of us are just embarking on our medical careers and some of us are retired - most of us are somewhere in between. Some of us are deans of medical schools or nationally renowned health policy experts. Nearly all of us take care of patients. Many of us have never ventured into politics before but driven by pragmatic idealism, we are bringing the voice of physicians to communities across the country and to the national stage. Our common vision and shared ideals will ensure that we help to create the kind of health care system every person deserves. Patients OVER Politics has been the historic mission of our organizations. We believe in affordable, accessible, and quality healthcare for ALL. All means ALL. American health care costs too much covers too little and creates frustration for too many. The issue isn’t more money for healthcare but more healthcare for the money. As the results of the 2018 election made crystal clear, the country and our patients want action. We will not be sitting on the sidelines. In addition, to reforms that maintain, protect and strengthen the progress we have made with the passage of the Affordable Care Act, we will be actively engaged in the debate on how best to achieve universal healthcare for ALL. Our physicians are on the front lines of this preventable public health crisis. Gun violence victims are cared for by physicians and the long term effects of gun violence on victims and their communities is a chronic health problem. Gun violence prevention is clearly our lane. We will tirelessly advocate for policy changes until gun violence is a thing of the past. For more than 20 years Congress has voted to deny funding and effectively ban the Center for Disease Control from doing critical scientific research to understand and prevent gun violence. Doctors for America has lead this effort and joined with the medical, public health, and science communities to say: enough is enough, #EndTheBan! We support universal background checks contained in HR 8 which is on the verge of passing the House of Representatives. We support screening for safe storage of guns -- particularly in homes with children. We support evidence-based policies limiting gun possession by high-risk individuals. We support increased attention and support for secondary victims of gun violence. All too often we watch as our patients are forced to choose not to take the pharmaceuticals we have prescribed them because they can not afford them. We will no longer sit quietly by as the cost of insulin doubles in a four year time period or the newest innovations in the treatment of life-threatening chronic diseases remain out of reach because of cost. The U.S. has long had a problem with the rising costs of drugs and the unaffordability of prescriptions to our patients and the healthcare system as a whole. We plan to lead the push for solutions that foster continued pharmaceutical innovation yet also deliver medicines that are both affordable and effective. We must ensure that the experiences of physicians are at the table so that we can advocate on behalf of our patients and their needs. Doctors for America is 501(c)3 nonprofit that envisions a healthy America for everyone. We are committed to evidence-based medicine, transparency, putting our patients first, and do not accept funding from pharmaceutical or medical device manufacturers. November 9, 2018 at 10:08am . Dozens of Doctors for America physicians and medical students spoke at Protect Our Care's national bus tour. They spoke in defense of pre-existing condition protections, Medicaid expansion and urged Congress to expand access to care not remove it. October 21, 2018 at 9:50am . September 2, 2018 at 3:55pm . Executive Director Jim Duffett was quoted in the Washington Post about the role physicians play on the campaign trail. DFA submitted a letter of opposition to U.S. Senate Leadership in opposition to SCOTUS Nominee Brett Kavanaugh. View our letter. "Amplifying the Physicians Voice in the 2018 Election - Expert Call" - DFA Board Member Justin Lowenthal, MD/PhD Candidate led a call along with Andrew Goldstein, MD; Medical Student Avanthi Jayaweera, and Perry Tsai, MD/PhD. If you missed our call view our recording in September here. "DFA Opposition to SCOTUS Nominee Kavanaugh - Expert Call" DFA Board Member Dr B. Cameron Webb led a call with various organizations including The Leadership Conference, Health Care for America Now, The Brady Campaign, National Women's Law Center, and Demand Justice to discuss the effects the SCOTUS Nominee Brett Kavanaugh will have on our patients and what we can do to oppose his nomination. To hear the recording visit our website in September. DFA Board Member Dr Joe Kanter spoke with Fox 8 about the need to build a strong relationship between patients and their primary care physician and help avoid ER visits. Dr Meghana Rao and medical student Justin Lowenthal hosted Dr Diane Horvath-Cosper to explain the Title X proposed rule and implications for women's health and then attendees submitted public comments. DFA Maryland members attended a press conference in opposition of Title X. It was hosted by Baltimore City Health Commissioner Dr. Leana Wen and Mayor Catherine Pugh. Also present were both Maryland Senators (Ben Cardin and Chris Van Hollen) and and all three of Baltimore's House Representatives. Executive Director Jim Duffett met with a coalition of physicians to brainstorm about ways physicians can have a larger impact on public policy in the state. After a one year effort, DFA Board Chair Dr. Scott Poppen wrapped up signature gathering for Utah's Medicaid expansion ballot initiative, Utah Decide Healthcare. 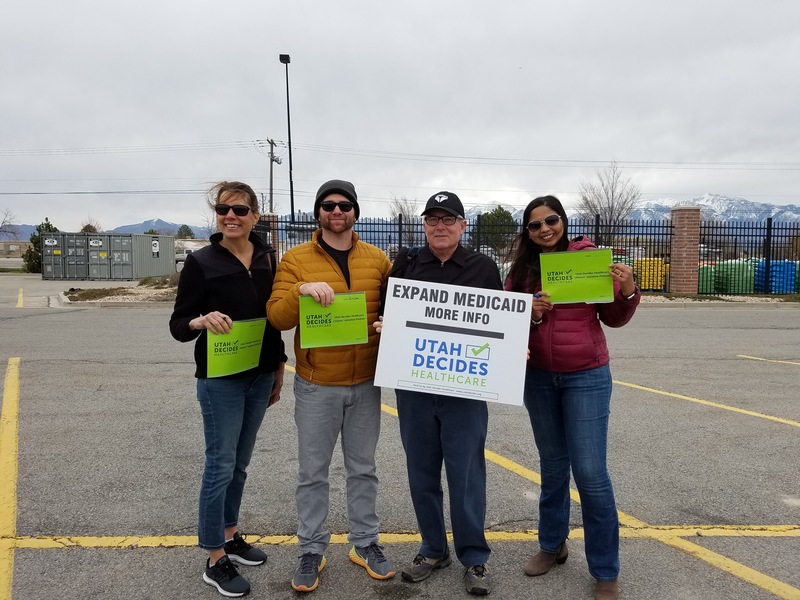 Thanks to the work of 1000 volunteer signature gathers, the Campaign turned in more that 195,000 signatures collected across the state to provide healthcare coverage to more than 150,000 Utahns and capture over $800 million in federal tax dollars. The initiative, now called Proposition 3, next heads to the November ballot with polling showing strong public support. July 16, 2018 at 9:55am . Our National Leadership Conference in Baltimore convened dozens of speakers on gun violence prevention, prescription drug pricing, the future of health care, substance use disorder, and others. Featured is our medical students who were recipients of our scholarship fund. DFA members stood in solidarity with Congressman Dr Raul Ruiz and House Minority Leadership urging legislation to prevent the separation of children from their parents at the border and for immediate reunification. Dr Parveen Parmar attended a rally in Los Angeles with other physicians calling for the reunification of children and parents at the border. DFA Board Members Dr Meghana Rao and medical student Justin Lowenthal along with Maryland DFA members, joined hundreds in Baltimore demanding action be taken to stop the separation of families at the border and called for reunification. April 14, 2018 at 3:20pm . This energy and commitment to our patients will culminate at DFA's National Leadership Conference that begins on June 1st. Substance use disorders affect all communities and all socioeconomic groups. Learn about the particular aspects relating to adolescents, how to screen & resources available. Even if you are not treating adolescents, you can be part of your community, state and national response to this crisis. Doctors for America is proud to announce the addition of medical student Christine Petrin to the national Board of Directors. Click here to learn more about Christine. Dr Sanjeev Sriram joined House Minority Leader Pelosi and Senate Minority Leader Schumer to celebrate the 8th anniversary of the Affordable Care Act. Our team led by Nina Agrawal MD, David Berman MD, Justin Lowenthal, Sanjeev Sriram MD supported thousands of students calling for gun violence prevention legislation on National School Walkout Day March 14th. DFA held an expert call with guests Jeffrey Swanson PhD, Amy Barnhorst MD, and our Senior Advisor Harold Pollack PhD to discuss the role physicians can play in gun violence prevention. CA State Director Dr Parveen Parmar joined physician advocates during the March For Our Lives event in Los Angeles. Dr Nathan Chomilo penned an op-ed in the Twin Cities Pioneer Press on the effects that work-requirements will have on his patients. Dr Nathan Chomilo highlighted early childhood intervention as the best way to address Minnesota's opportunity gaps in the state Capitol. Dr Nathan Chomilo along with AAP led legislative visits with Minnesota Congressional representatives. Dr Umbreen Nehal was recognized as one of Linkedin's top 15 women. Drs Donald Nguyen & Matthew Noordsij-Jones joined the March For Our Lives event urging Congress to address gun violence. Dr Katherine Scheirman marched with hundreds of citizens demanding action from Congress to address gun violence prevention for the March For Our Lives events across the country. DFA-NY joined Senate Minority Leader Schumer along with thousands of protesters demanding action on gun violence prevention. Dr Nina Agrawal lead the DFA-NYC House Party focused on engaging physicians to advocate for gun violence prevention. Dr Lisa Plymate attended the "Neighborhood Conversation to Combat Youth Violence" in Seattle representing DFA-WA. Click here to read more about the conversation. Medical student Kaia Barth stood in solidarity with millions across the country demanding action to address the public health crisis of gun violence. DFA's prescription drug team joined dozens of organizations in support of Maryland's HB 1194. March 23, 2018 at 12:22pm . THEN: After years of pursuing health care reform, President Barack Obama signed the Affordable Care Act on March 23, 2010. The ACA cut the uninsured rate in half by expanding Medicaid coverage to low-income individuals and by providing Cost Sharing Reductions to those in the individual health insurance market. It provided consumer protections by eliminating pre-existing conditions as a barrier to obtaining health insurance and required insurers to cover preventative care services. Doctors for America was one of the leading physician organizations supporting the passage of this monumental health care reform. On the morning of October 5th 2009, DFA doctors, myself included, stood together in the Rose Garden representing the voices of our patients in our home states who desperately needed access to high quality, affordable health care. Below is a picture of our DFA leaders in 2010. NOW: The election of 2010 brought in new Congressional leadership and in 2016 a new Administration. Our work towards health reform did not end with the passage of the ACA. We now have to defend our progress. Thanks to YOU we successfully pushed back repeal efforts and have continued to fight against the undermining of the ACA through Medicaid work requirements and the elimination of vital consumer protections. DFA will continue to defend the ACA state by state and federally. Below is a photo from a Capitol Hill press conference yesterday where DFA member Dr. Sanjeev Sriram spoke on the 8th anniversary of the ACA. CALL: Capitol switchboard (202) 224-3121 and ask to be connected to your elected Congressperson. MESSAGE: "Happy 8th ACA Anniversary - the ACA is here to stay!" In addition to our on-going defense of the the ACA, DFA is committed to addressing the issue of gun violence prevention. Join our expert call with Doctors Jeffrey Swanson and Amy Barnhorst along with DFA Senior Advisor Harold Pollack next Monday March 26th at 9pm EST. These experts will discuss the epidemiology of mental health and gun violence, and dilemmas facing front-line medical and mental health providers seeking to prevent suicides and homicides. Panelists will also discuss prominent proposals such as gun violence restraining orders. Click here to RSVP. Finally, I would like to cordially invite you to join DFA's continued work in defending the ACA, designing the next generation of health care reform, gun violence prevention and our other initiatives by attending our 2018 National Leadership Conference June 1 - 3 at Johns Hopkins University. Click the button below to register.